Seeing that my pantry is bursting at the seams with K-Cups, I thought I'd share my thoughts on my Keurig's new "Indulgent" beverages as well as a few of the new K-Carafes that I've tried. A few of them have instantly become my new faves. 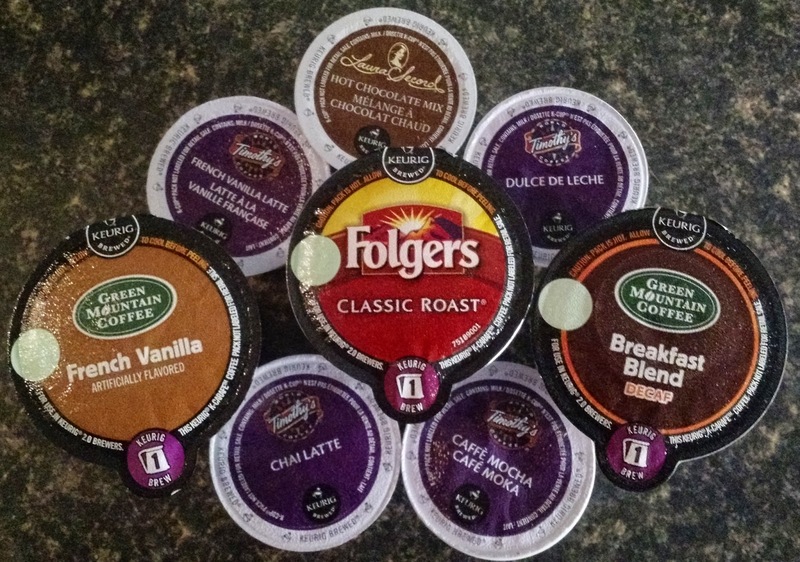 All of the K-Cups below are available on Keurig.ca. Timothy's Chai Latte: Of the four Timothy's Indulgent beverages I purchased, this one is my favourite. It's not overly sweet and has the perfect blend of spices that isn't overpowering. I'd recommend brewing this at 8oz or smaller. The 10oz setting waters it down too much. Timothy's Dulce de Leche: The caramel flavour from this K-Cup is nice and smooth. If you're used to a huge caffeine kick in the morning, I wouldn't recommend it. It's better suited as a beverage after a long day at work or after dinner. Timothy's Caffé Mocha: This K-Cup has a nice balance between chocolate and coffee flavours and not too sweet. I would recommend stirring it after it's brewed and while you drink it as the chocolate tends to pool at the bottom of the cup. Same as with the Chai Latte, I find it tastes better when brewed at the 8oz or lower settings. Timothy's French Vanilla: I want to like this more than I actually do. It's my least favourite of the four. I've tried brewing this cup using the various cup sizes and I just can't seem to get it right. Each time I make it I find that the vanilla flavour is very weak and I don't taste anything that resembles a "latte". Laura Secord Hot Chocolate Mix: I've tried most of the available hot chocolate K-Cups and this one is by far my favourite. Even at the 10oz setting the hot chocolate comes out creamy and has a strong chocolate flavour. I'd recommend continuous stirring to make sure you get all of the chocolately goodness that falls to the bottom of the cup. The K Carafe flavours listed below were purchased on Keurig.com. I have not yet seen them in Canadian retailers. Green Mountain Breakfast Blend Decaf: I'm not a huge fan of decaf coffee since I usually need the caffeine jolt to keep me going. This coffee is very flavourful even when it's brewed on the 4-5 cup serving. Green Mountain French Vanilla: This is my favourite K-Carafe cup so far. The coffee has a nice bold flavour with just the perfect hit of vanilla. Folgers Classic Roast: What can I say, it's the best part of waking up...See what I did there? In all seriousness, this K-Carafe cup is definitely one for those who like strong coffee. It has a very intense flavour which is a perfect wake up call for me. If you have any recommendations on K-Cups or K-Carafes to try I'd love to hear them. Leave a comment below. I received the Keurig 2.0 K500 brewer complimentary from Influenster for testing and review purposes. The K-Cups and K-Carafes were purchased by me and the opinions posted are my own.